A fresh and lively translation, with extensive, provocative, and, likely, inflammatory commentary by Bloom, of the Book of J--the seminal text of the first five books of the Bible; a text, most biblical scholars agree, written around 950 B.C. by an unknown genius. "Before a plant of the field was in the earth, before a grain of the field sprouted--Yahweh had not spilled rain on the earth. . ." So begins the translation by Rosenberg (ed., Testimony: Contemporary Writers Make the Holocaust Personal, 1989, etc.) --a translation that, as Bloom points out, "preserves [J's] ironic tone and stance." But therein lies the probable rub: to Bloom (Ruin the Sacred Truths, 1988, etc. ), J "was not a religious writer," and "the stories of the Creation, of the Patriarchs, of Joseph, of Moses, were not for her holy tales, not at all" (note the "her": Bloom, through a close reading of Rosenberg's translation, concludes that J was a woman, likely of the royal house living at King Solomon's court). 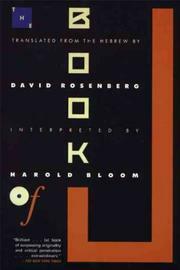 Readers must decide for themselves whether Bloom's conclusion about J not being a religious writer, and his further commentary (which likens J's "Yahweh shaped an earthling from clay of this earth, blew into its nostrils the wind of life" to "a solitary child making a mud pie") reflects mostly Bloom's own metaphysical stance ("I myself do not believe that the Torah is any more or less the revealed Word of God than are Dante's Commedia, Shakespeare's King Lear, or Tolstoy's novels"). But nearly all will find this a unique, challenging, and courageous experiment in litary/biblical criticism.